In March 2012, the Commonwealth Attorney-General’s Department issued a discussion paper which flagged the possibility of codifying or otherwise reforming the Australian law of contract. Half a decade later, it seems distinctly improbable that the initiative will yield anything of substance. The result is that would-be reformers of the Australian law of contract might well feel frustrated at the uncertainty as to how the cause of reform ought to be prosecuted. The object of this article is to offer up some suggestions in this regard. It seeks to identify some practical steps which might be taken by way of reform of the Australian law of contract. It seeks in particular to identify those reforms which are sufficiently uncontroversial as to attract support on the part of government. The article also grapples with the question of whether the more radical options set out in the 2012 discussion paper – including the prospect of codification – were ever suitable responses to the challenges facing the Australian law of contract. 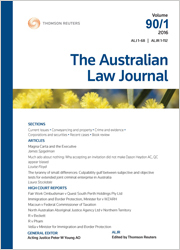 This article considers constitutional questions that arise in relation to recent calls for internment in Australia with respect to those suspected of engagement in terrorism activity. Internment has been practised in the past in Australia with respect to war or warlike conditions, though the extent to which Australia is currently “at war” is of course highly contested. Laws in various Australian States, and at federal level, also currently contemplate preventive detention, though this is in the context of individuals who have already been convicted and sentenced for crime. As such, the current proposal differs significantly from preventive detention as currently practised in Australia. The article considers whether the Commonwealth’s defence power would likely support such a scheme, whether it would be valid if the power were reposed in a member of the Executive, and whether it would be valid if reposed in a court. As a result, it considers whether such schemes are punitive in nature, and the essential character of such a power. The article is focused on the constitutionality of such a scheme, rather than its merits as public policy. In December 2017, the world’s first international criminal tribunal since the Nuremberg and Tokyo Tribunals – the International Criminal Tribunal for the Former Yugoslavia (ICTY) – ceased operation after almost 25 years of trials and appeals. From the Tribunal’s earliest days, Australians made prominent contributions to the ICTY as judicial members, prosecutors, investigators and defence counsel. This article reviews the role of these Australians in the development of the ICTY’s procedures and jurisprudence. The success of these Australians at the Tribunal should encourage members of the legal profession to consider contributing to the ongoing work of the International Criminal Court (ICC) or the field of international criminal justice more broadly. For the PDF version of the table of contents, click here: ALJ Vol 93 No 4 Contents.